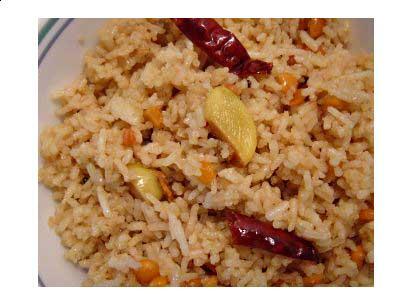 Tamarind rice is an Andhra delicacy. It is made most by South Indian Iyengar community. In south India, tamarind rice is known by many names like Pulihora, Puliyogare, Puliodharai and Puli Sadham. Tamarind rice or imli rice is a delicious South Indian variety of rice. 1. Wash rice and soak for 20 minutes. Drain. Boil 5 cups of water in a pan and add rice. Cook till done. Strain in a colander and spread on a big plate. Sprinkle a little oil over rice and mix very gently. 2. Heat 2 tbsp oil in a kadhai/wok. Add mustard seeds, dry red chillies, both dals. Fry till dals turn light golden. 3. Add hing, curry leaves, turmeric powder and peanuts. Fry for 1 minute taking care that dal do not burn. 4. Add tamarind pulp and salt. Cook for 2-3 minutes. Lower heat and cook covered for 5 minutes so that tamarind become dry and dal become soft. 5. Add this imli mixture in the rice and mix gently. Serve tamarind rice hot.